The start of a new season is always exciting-it’s a chance to revamp your wardrobe and debut your latest looks. With transitions can also pose challenges. If you want your closet to rock a little bit this season, sharp leather ankle booties should be your first port of call. They have been a constant in my coveted closet since I started wearing any sort of heel, in every finish from cut-out, buckled suede, and studded leather just to name a few. Each chic yet flattering pair lends an edge to both casual with a pair of boyfriend jeans and leather pants in equal measure. Two years ago I thought I’d made a clever purchase, a pair of white leather LD Tuttle ankle boots that curved rather seductively, below the ankle. I could wear them the entire day, no problem. They seemed to work well with everything I owned; skirts, dresses, skinny jeans, boyfriend jeans, everything. They quickly became a wardrobe staple. While theses boots are mostly quite casual in feel, the way you wear them is not. You have to dress them up. Not a lot, but there’s something about them that begs for attention with a skirt or dress. Aside from working well with narrow legged trousers, they also go well with boyfriends jeans, making them super versatile. In the end, invest in an ankle boot for fall and vow to wear them to death. 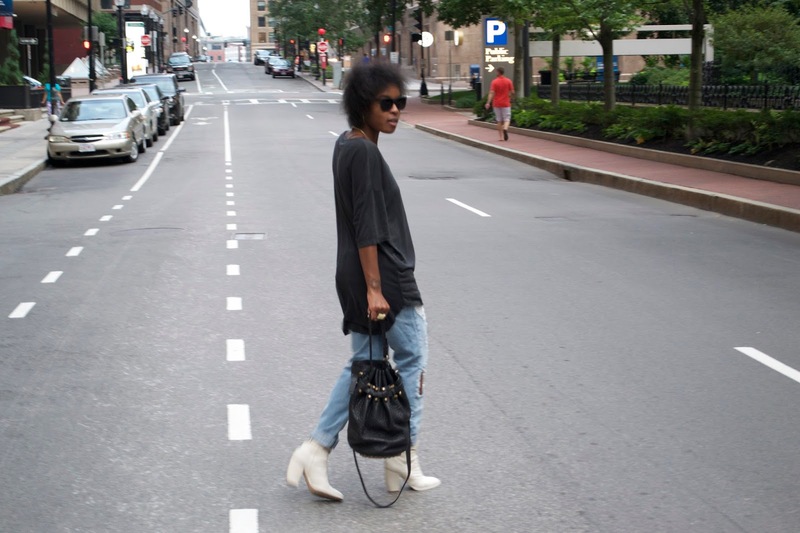 H&M Trend oversized t-shirt, Boyfriend jeans , LD Tuttle leather ankle boots, Alexander Wang Diego bag, Super sunglasses.